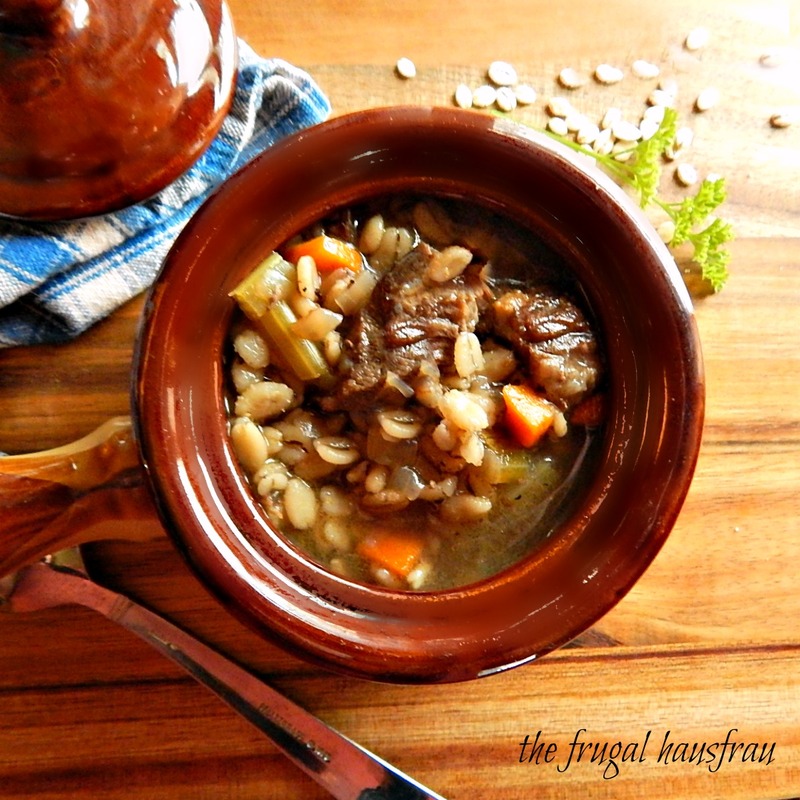 Beef Barley Soup seems to have never gotten really gotten it’s due as a world-class soup. Maybe because most of us use the recipe on the back of the box. That Beef Barley Soup is good fare, but not exceptionally great. And I like it. I’d never turn down a bowl if you know what I mean. But a real deal homemade Beef Barley Soup, starting from scratch? Now that I love. What I love even more is this shortcut version. The problem is, these days, it’s hard to make a real deal from bones soup because in so many areas it’s hard to get bones for beef stock and when you can get them they can be really pricey. Gone are the days when soup bones could be picked up for a pittance (or even free) because every bit of the animal is sent to wherever the best price can be gotten for it. And bones go to producers of food and for roasted dog bones. Even my pot roasts no longer have bones in them. Luckily I have a few tricks up my sleeve to get that real deal flavor without real deal bones. Actually a few tricks, and they start with leftover pot roast and doctored up beef broth. And it makes a very good, really solid Beef Barley Soup. I do wonder what my I wonder what my Great Grandma (Scottish) would think of my methods, below. She’d be shaking her head. And can you imagine her face when I opened a BOX of broth? I think you’re gonna find when you take a bit of time to doctor up your broth, you’re going to come up with a soup that tastes like it’s a bona fide made from bones simmered all day from scratch soup. Get it bone i – fied, lol! The flavor is deep and rich, the veggies perfect and the barley (cooked on its own first and then added in) is just perfectly al dente and flavored by the broth. Cooked separately, the barley doesn’t make the broth all cloudy, either, which kind of muddies the flavors. Serve this hearty Beef Barley Soup with crackers or even better with hunks of bread (I gotta give a shout-out to my Crusty Bread, easy overnight and no-knead) as just about the perfect thing to go with Beef Barley Soup. Now, you’ve got a meal! If starting just from a broth, caramelize vegetable scraps (from the veggies you’ll be using in the soup) and use them to infuse the broth with flavor. Strain them out. Simmer dried Porcini or Shitake mushrooms, one of my “Stealth” ingredients, in the broth for a deep, rich taste. They’re pricey but worth it. If not, finely dice button mushrooms and cook until deeply browned, just like I do with my Classic Vegetable Soup. Sneak a packet of gelatin in the soup to simmer away during the final stages…it adds just a hint of body that’s missing in a store-bought broth. After all, gelatin is made from bones and such. This is a go-to recipe when I have leftover pot roast. I’m actually a bit stingy about setting a bit aside so it’s not all gobbled up by a gluttonous family member (you know who you are!) Not only do I love this Beef Barley Soup, I recognize that a great way to work some fabulous frugality into the budget is to use a more expensive protein in more than one meal. The first meal, heavy on the meat, can be quite pricey if it’s all eaten up – but if you add a second, third or fourth meal (like this huge pot of soup – I’ll serve for dinner the first night, freeze enough for a second meal and divide the rest into individual servings to freeze for lunches) into the equation, then all of a sudden you can “cost average” the meals. I call this “dividing and conquering.” The same holds true, with the “healthiness” of the meal. A huge pot roast with “mashed and a side” might be a bit on the heavy side – if your next meal is chock full of vegetables, like this soup, you’ve just found a bit of balance health wise and money wise. Add olive oil to Dutch oven and when heated through, add vegetable scraps, sugar and onion. Cover and adjust heat to medium, stirring now and then, until the vegetables begin to caramelize, about 20 minutes. Remove lid, stir until lightly browned. Add rest of ingredients and three cups of water. Cover and simmer at least 20 minutes and up to 1 1/2 hours. Strain broth into a bowl, pressing on vegetables. Use remaining cup of water to pour through the vegetables and allow to drain for several minutes. If desired, before straining, the dried mushrooms, which will be floating on the top of the broth may be removed, finely chopped and added to the soup. The longer the broth simmers, the less flavor will be left in the mushrooms, so taste one to see if this would be worthwhile. If you don’t have dried mushrooms, finely chop 8 ounces fresh mushrooms and saute until deeply colored. Add to the broth. Bring stock to a simmer, add gelatin, carrots and celery. Simmer about 10 minutes. Add cabbage and tomatoes if using. Simmer another five minutes. Add barley and simmer about five to 10 minutes until heated through and vegetables are at the desired stage of tenderness. I generally buy 2 boxes of beef broth, 4 cups each. In this instance, I’d already used about a cup of the broth in the pot roast, Pot Roast Carbonnade. The rest went in the soup, but I held the last cup back until the end, just in case. Beef broths vary widely in strength, flavor and saltiness, so this allows me to hedge my bet, here. I don’t wish to overwhelm the soup with a very strong broth, but I don’t want it to be dull and lacking either. The barley can be a variable, too; depending on how well cooked, it may absorb more broth then expected. It’s nice to have a bit of broth on the side in case you wish to add. This entry was posted in Click here for Bargain Meals, Click here for Fabulous Food Posts and tagged Bargain Meal of the Week, Barley, Beef, beef & barley soup, Beef Stock, Carrots, Freezes Well, leftover beef, mushrooms, Pot Roast, Soup. Bookmark the permalink. I think a veggie version would be wonderful!! Barley is often under rated! I imagine you have no problems getting the needed bones! Here they are all divided from the meat and sent off to be smoked for dogs! I have been considering buying a case of bones, which one of my butcher shops says they can order in, but it seems like such a hassle. Where do you live? Odd that you can’t buy bones … we certainly have NO shortage of them here in Canada. Minnesota. Used to be there was a BIN of bones for dogs for free, good soup bones were just pennies. Then they just went away. It turns out they get sold to big companies who smoke them for dogs, and to restaurant suppliers for chefs. So I used to save the bones from roasts, but now almost all roasts come boneless. When we buy a chuck roast, there is a little hole where the bone was. Now, around Christmas this year, I saw a few packages of little bones, they were $11.97 a pound, then went on sale for $6.97 a pound after a few weeks. Last time I made this soup, I went to three different butcher shops, spanning an area of about 25 miles and picked up all the bones they had frozen to sell, four packages, totaling about two pounds, cost $21.00!! To put it all in perspective, the chuck I used in this was $3.49 a pound! Crazy, huh?? I mentioned this problem to a butcher in the grocery store who took me aside and told me there was an “artisinal” butcher in Woodbury, MN, who had bones. It seems like an elusive quest – like a search for a wild orchid! Sophie, I think this would be marvelous with chicken broth. I sometimes cut the beef broth with chicken broth, too, since home-made chicken broth has such better body than boxed beef. Some really excellent tips on “doctoring” soup made from fast ingredients. And while normally Beef and Barley soup isn’t something I gravitate to, yours looks and sounds delicious, as does the roast beef carbonnade! Hi, and thanks for the comment. 🙂 That pot roast is really a family favorite. I think other soups would be wonderful with this same method and a bit of left over pot roast, too. My Mom used to make what she called “Steak Soup” in the crockpot – it was always good but a little lackluster. The beef barley soup looks very appetizing … no mushy barley or vegetables in there. I haven’t had beef barley soup in about 15 years. I used to buy the dried soup mix in the bulk food store and make that but the msg etc turned me off. I’ve never made home made beef stock as I rarely buy beef with bones (other than steaks). Right now I’m trying to use the contents of my pantry for soup making, I have a handful of yellow split peas, the last pound of cannellini beans that my dad planted and harvested the year before he died … it’s amazing that 5 yr old beans still get tender in 1 hour of cooking after pre-soaking overnight. And some Berta Talaska beans that have been in the attic even longer … kind of like a red kidney sized pinto bean. And, lots of noodles. Rice and wheat pasta. Fantastic post! I’m glad you shared it, so now I have a great reference when I buy a leg of lamb for Easter! Of course, I’m a traditionalist and would simply make a Scotch Barley Soup with the lamb bone! I was using some older beans once and had a heck of a time getting them soft – I transferred them to my pressure cooker and still it was taking forever. I remembered how I’ve used a bit of baking soda when I soften dried dates, added about 1/2 a teaspoon and it worked well. 🙂 Thought I’d mention it even if you didn’t have that issue, just in case someone else runs across it. I’ve been working on my pantry, too. Out with old, in with the new!! I’m glad you liked the leg butchering pics. I DID think of lamb barley soup but the lack of barley (I’m trying to avoid buy packages of anything these days) has been discouraging me. I could buy just how much I needed loose at the bulk food store, rather than the pound package at the grocery store, but the temptation of going crazy when I get in the bulk store is holding me back. As well as the snow. I’m going to have to go out in another 15 minutes or so to shovel the miserable stuff. Oh, and I forgot to mention how absolutely gorgeous that lamb looks! My mouth was watering! PS: Here’s a picture of one of the lamb meals with the meat. That looks fabulous! Whenever I would visit my grandmother as a child, I would always look forward to her Barley & Oxtail soup, it had such a rich beef flavor. That was a really long time ago, but it’s still a happy memory. Thanks for sharing!